Posted January 10, 2014 by Dan Weisberg & filed under Leadership Rockland Program. Leadership Rockland is a recipient of Nyack College’s 2014 Social Justice Award. The award will be presented at a luncheon on Friday, January 17 at 12:30 PM at the Nyack Seaport, 21 Burd Street, Nyack NY 10960. A Rockland County entrepreneur, Maria Luisa Whittingham, owner of Maria Luisa Boutique and ML Gifts & Accessories, both in downtown Nyack, will also receive a Social Justice Award. 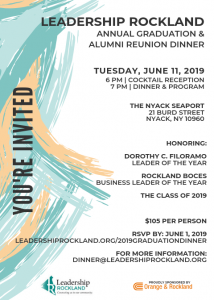 Maria is also a graduate of the Leadership Rockland Program. For more information, contact Earl Miller, executive director of community relations at Nyack College at Earl.Miller@nyack.edu or by phone at 845.675.4791. For reservations, contact Nancy Gates at 845.675.4431.